Thanksgiving has a reputation for being a great lazy holiday. You eat your body weight in food and then spend the day “watching” football (read: napping). Sounds great, right? Well, if you’ve ever hosted Thanksgiving, however, you know that this reputation couldn’t be further from the truth. Thanksgiving is a lot of work for all parties involved. That includes your plumbing. Hosting family and friends in your home puts your plumbing under a lot of strain. All this new traffic is often the little push that makes a plumbing problem visible. Here are four very common post-Thanksgiving plumbing problems we encounter, and what to do about them. Easily the most common post-Thanksgiving plumbing problem, and one of the most annoying. Just as you’re washing a mountain of Thanksgiving dishes, your kitchen sink decides to stop draining. Now you have to deal with the clog before you can finish cleaning up the giant Thanksgiving mess. Kitchen sinks clog when you inadvertently pour stuff down the drain that doesn’t belong there. Usually, the clogging culprit is either “FOG” or food remains–especially on Thanksgiving. “FOG” stands for Fat, Oil, and Grease. When these waste products cool, they solidify into a sticky, thick substance. If this substance collects in your pipes, it’ll form a nasty clog. 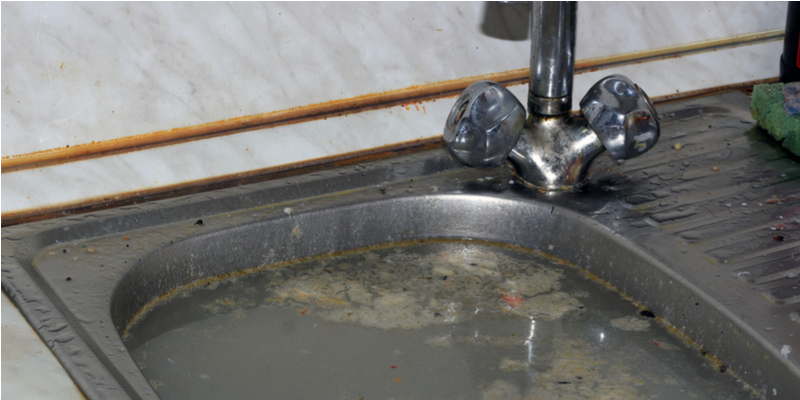 In your rush to clear things up, it’s easy to throw things that don’t belong into your sink disposal. Material like bones, coffee grounds, potato peels, eggshells, or celery should never go down the drain. This stuff can slow down or break the disposal or catch in the sink’s drain. Don’t use chemical drain cleaners. They might help clear the clog, but they could also damage your pipes. Luckily, there are a couple other easy solutions you could try. Obviously, you should start by plunging your sink. Run the cold water while you’re plunging and use a cup plunger. If plunging doesn’t seem to be doing the trick, there are a few other things you could try. Boil some water to pour down the drain. If that doesn’t help, try a vinegar and baking soda solution. You could also remove your disposal and p-trap and clean them out. If your nice, hot shower turns cold and very not nice it could ruin your whole day. If your in-laws’ shower turns cold, it could ruin your whole week. This problem won’t just affect your showers, either. You may have trouble getting hot water from any of your appliances. Most homes use conventional water heaters. These heaters heat up water in a large tank before you need it. When you turn on your hot water, your pipes transfer hot water from this tank to you. Meanwhile, the tank continuously refills with cold water. It takes time for the heater to reheat the water filling the tank. Most water heater tanks are sized for the home they’re installed in. When more people use your water than usual, you’ll naturally use more hot water. When that happens, you may use up all the hot water faster than your tank can resupply it. Running out of hot water doesn’t necessarily mean something’s wrong with your heater. Try implementing a hot water schedule. Have one person shower at a time, and try to take shorter showers. It’s a pain, but it beats the alternative. Unfortunately, running out of hot water can be a sign of water heater problems. If too much sediment builds up in your tank, it could block the heater. Try flushing your water heater to see if that helps. You could also try turning up the thermostat, though you should be careful not to turn it too high! It’s easy to blame this one on your relatives, but you may actually have a point! Like the other plumbing problems here, clogged toilets happen more frequently where there are lots of people using them. Unfortunately, that’s also precisely when they’re at their most frustrating. Lots of people don’t follow “flushing etiquette.” They flush too much toilet paper, they flush things they shouldn’t, or they don’t flush at all. When one or two people don’t follow flushing ettique, it’s not a huge deal. It might lead to a clog eventually, but that process happens slowly. When several people don’t follow proper flushing etiquette, however, it becomes a more serious problem. When you flush things that shouldn’t be flushed, they don’t always make it through the pipes all the way. Instead, they get stuck part of the way through. There, they collect other debris over time and eventually form a clog. First, you’ll have to plunge the toilet or toilets in question. Use a flange plunger for best results. 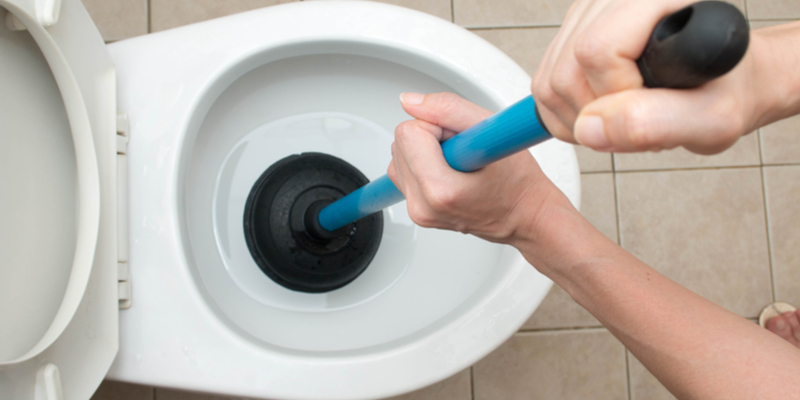 If your plunger doesn’t seem to be doing the trick, try adding almost-boiling water into the bowl. You could also try the baking soda and vinegar trick we described earlier. To prevent clogs in the future, be careful about what you flush down the toilet. Toilets should really only flush waste water and toilet paper. Even flushable wipes aren’t always safe for flushing. Diapers, tampons, cotton balls, q-tips, and other toiletries are never flushable. Thanksgiving is a chaotic time, especially if you’re hosting. In all likelihood, you’re too busy spinning about seventeen different plates to worry much about your plumbing. We don’t blame you! Luckily, even if you do run into a plumbing problem this Thanksgiving season, you’re not alone. Just call Mike Diamond any time this season and we’ll be there to help. Leave the plumbing stuff to us and get back to that turkey (or the nap that follows it! ).